This 18-carat white gold pavé ring is hand-made and set with brilliant-cut diamonds. 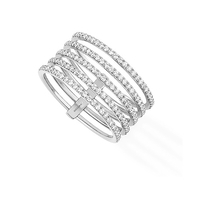 Stylised design and three pure lines echo the Art Deco movement: the thread of diamonds becomes light. With this Gatsby 5 Rows diamond ring, gold keeps a low profile: its elegance lies in the purity of a line that makes it a timeless addition to any woman's wardrobe. FREE Standard Delivery This is a special order item and we estimate delivery to you in 6-8 Weeks.